CRIME, GUNS, AND VIDEOTAPE: AIG Bonus Mess Stems From Simple Government Interference. 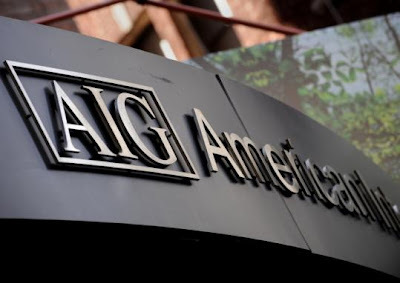 AIG Bonus Mess Stems From Simple Government Interference. Washington, DC—Our politician’s pretend outrage is laughable when under our free market system of government AIG should have collapsed except for un-American government free market tampering. There would have been no sky high bonuses or golden parachute severance packages for any of the architects of that failed company, just well-deserved unemployment. Other healthier American companies would have rushed and filled the void created by AIG’s demise. When our politicians used taxpayer funds to bail out this mismanaged train wreck they also had to accept their existing contracts including golden parachutes for retirees and those bonuses. Those who voted for the bailout deserve a severe beating from the American public not the bailed out executives of a company that should have been unceremoniously laid to rest. It’s my fervent hope that every American politician that voted for the bailout and that phony stimulus package be tried for treason. You hit the nail on the head Paul. A bit more insight on why we, the tax payers, will have to fund these bonuses. Thank you Christopher Dodd.